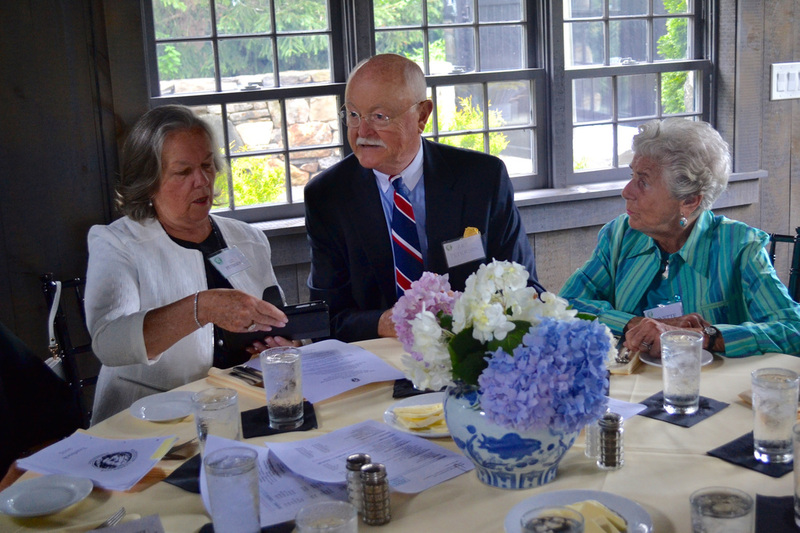 ​For over 100 years, the Washington Garden Club of Washington, Connecticut has developed the knowledge and love of gardening, enhanced the natural beauty of our community through civic plantings, and promoted the conservation of our natural resources. 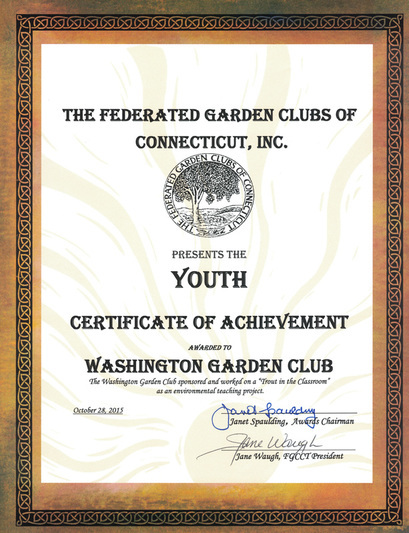 WGC has been a member of the prestigious and influential Garden Club of America since 1917 and the Federated Garden Clubs of Connecticut since 1972. 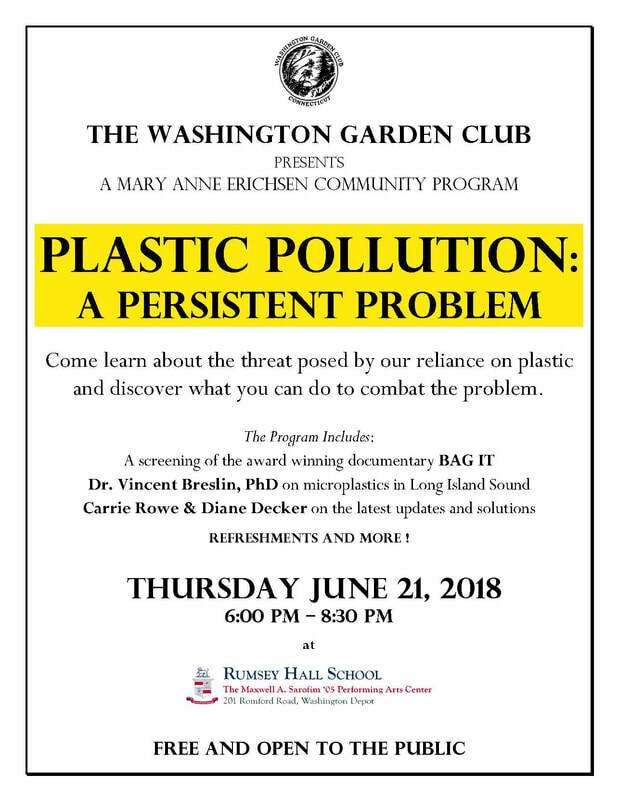 The Washington Garden Club is pleased to present a community event that will focus on the perils of plastic pollution and what we can all do to stem the tide of plastic in our lives. The event will be held at Rumsey Hall School in Washington Depot, CT on June 21st from 6:00 PM - 8:30 PM. The award winning film Bag It will be shown, followed by a presentation by Dr. Vincent Breslin, SCSU professor of Geography and Marine Sciences, who will speak about Microplastics - Macro problems: The Environmental Consequences of Consumer Plastics in Long Island Sound. To cap it all off, Washington's own Carrie Rowe and Diane Lash Decker (co-Presidents of the Washington Environmental Council) will provide updated information and recent developments as well as identify actions that each of us can take that will reduce plastic in our daily lives. Bring your family and your friends for an evening that will change the way you look at some of the "conveniences" of modern life. 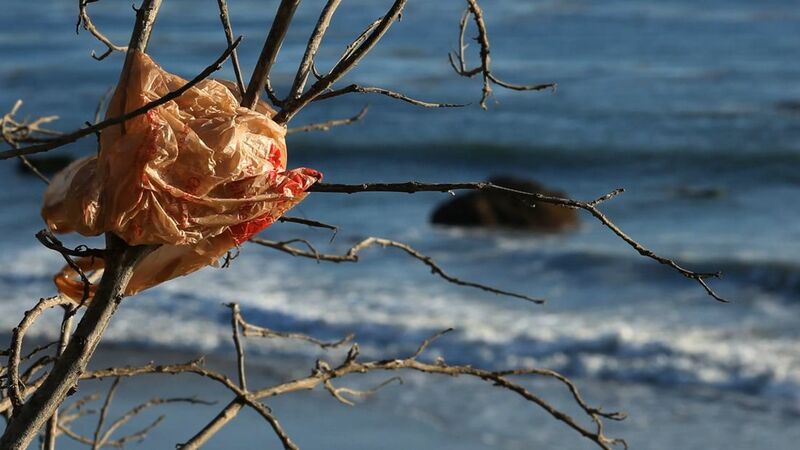 Learn how to make simple changes that can translate to big improvements in the plastic pollution problem. Rumsey Hall School is located at 201 Romford Road in Washington Depot, CT 06794. The event will be held at the Maxwell A. Sarofim '05 Performing Arts Center. We encourage carpooling to the event. Adequate parking is located on site, but please expect a short walk from the various parking areas. NOTE: For those coming from the north and east, the Romford Road bridge (between Route 202 and Rumsey Hall School) is currently closed to travel. Please plan your routes accordingly (via Whittlesey heading south from 202 or via Romford Road heading north from Route 109). Region 12's Spring 2017 newsletter has showcased the Washington Primary School's Farm Box project, sponsored by the Washington Garden Club and implemented by Renee Giroux. Congratulations to all involved and on the series of healthy (and delicious) harvests. The Garden Club of America's Annual Zone II meeting in 2017 will be hosted by the Washington Garden Club, and planning is already underway. Barbara Blake and Susie Magee have agreed to be co-chairs of the meeting. This dynamic duo has been responsible for producing some of the Club's most successful events, including the Pick of the Crop fundraiser in 2012 and the Centennial Birthday Party in 2014. The Garden Club of America is comprised of twelve geographic zones across the United States. Zone II consists of twenty GCA clubs in Connecticut and Rhode Island. The purpose of the zone meeting is to keep individual clubs abreast of national and regional trends and issues related to the GCA's mission. Each club sends its President and one delegate, and the GCA sends certain of its regional and national leaders. In all, there will be some 90 guests. Each club within a Zone hosts this annual meeting on a rotating basis. The last time the Washington Garden Club hosted the Zone II meeting was in 1994. It was a great success and enjoyed by all. Barbara Blake created the theme of the 2017 meeting: "Rock the Garden." She explained, "Rocks are so characteristic of Washington. We are surrounded by the architecture of rock walls and the natural rock-strewn beauty of our area, including the nature preserve Steep Rock and the Shepaug River (the word "shepaug" meaning "rocky" in the language of the area's early Algonquian inhabitants). In addition, rocks are a significant design element in the town's late-19th and early-20th century buildings and landscapes of famed architect Erich Rossiter, and rock gardens and outdoor sculptures abound in the area." 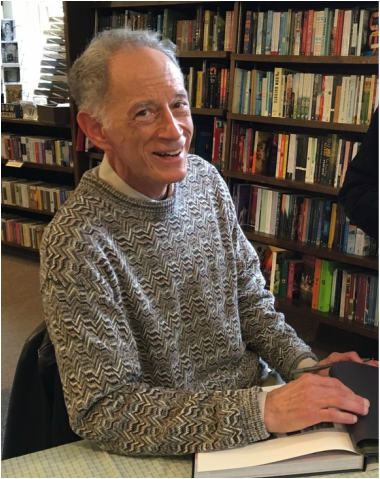 Club member Scott Tilden was recently featured at the Hickory Stick Bookshop in Washington, signing copies of the new book, America's Great National Forests, Wildernesses & Grasslands which he produced and edited. The book has been described as celebrating "the outdoor enthusiast’s dream bucket list." Published by Rizzoli International Publications with the U.S. Forest Service, America's Great National Forests features the thirty most notable national forests—while also celebrating more than one hundred different national forests in forty-four states—from the White Mountains of New Hampshire to the Olympics of Washington. Scott is the author or editor of numerous publications, including Architecture for Art: American Art Museums, 1938-2008; The Glory of Gardens: 2,000 Years of Writings on Garden Design; and Creating CityCenter: World-Class Architecture and the New Las Vegas. 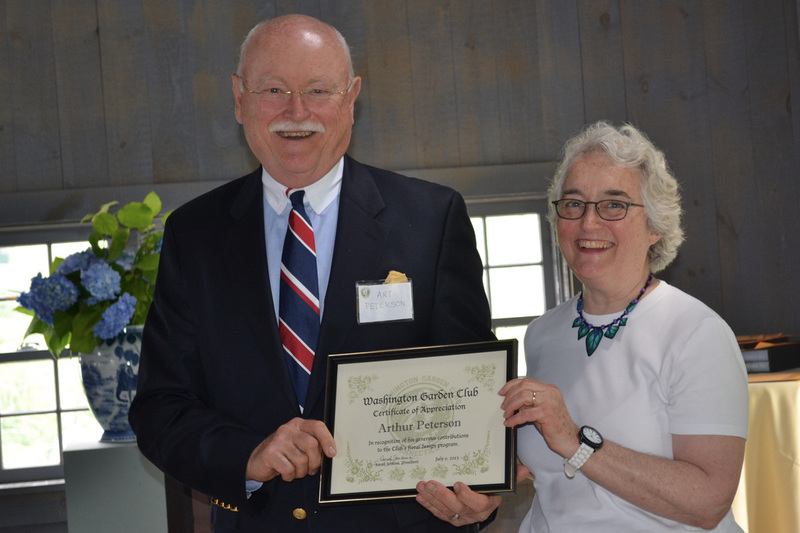 On October 28, 2015, the Washington Garden Club received an award from the Federated Garden Clubs of Connecticut for its "Trout in the Classroom" program in the Washington Primary School in 2014. Led by Club member Liz Peterson, the program taught children about the life cycle of trout and the related environmental issues surrounding aquatic life in the Shepaug River. The school children raised the fish from fry in their classroom during the fall and winter and then released them into the Shepaug in late spring. WGC 2015 Annual Meeting a Big Hit! 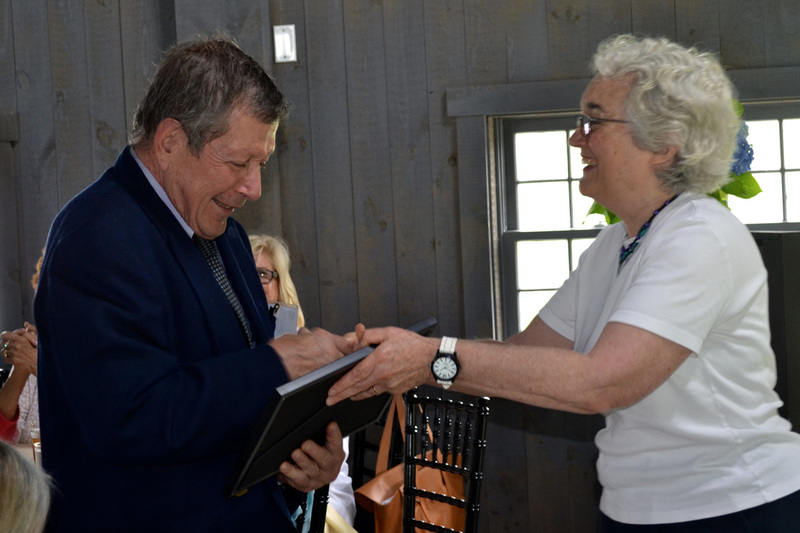 The Club's 2015 Annual Meeting enjoyed the highest attendance in recent years, as members gathered at the Rooster Tail Inn in Warren, CT to review the past year and look ahead to the new one. Club President Sarah Jenkins closed the session by outlining her plans for a complete revitalization of the Club in the upcoming years, calling the initiative the "Second Century Project" in light of the fact that the Club is now 101 years old. Special awards were given to Peter Bonachea for his work in building the exhibit panels for the Club Centennial History Project and Art Peterson for his work in building new floral display pedestals. 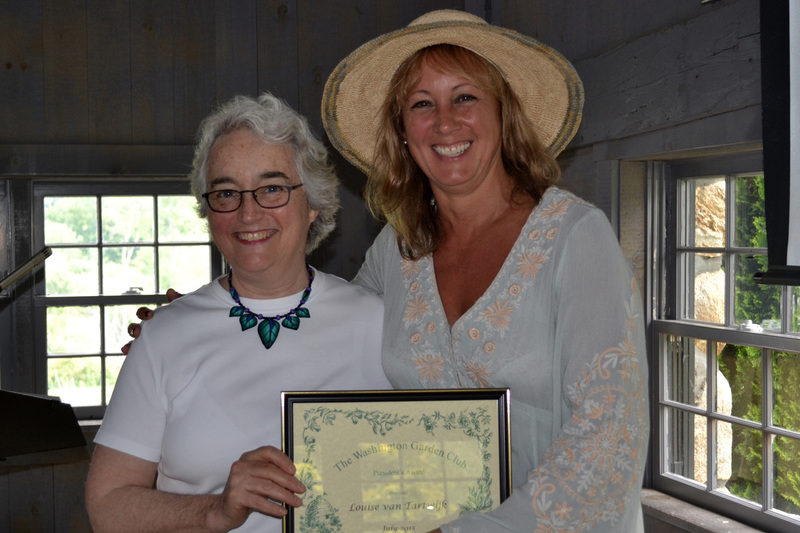 Gay Vincent-Canal presented the Beatrice Hessel Horticulture Award and tray to Anne Kearney, and acknowledged a tie in the runners-up between Linda Dishy and Diana Chamberlain. In closing, Louise Van Tartwijk was given the President's Award for outstanding service to the Club as head of publicity. A sample of the table arrangements provided by Jillian, posed on one of the new floral display pedestals built by Art. L to R: Mary S., Ann H., Ann B., and Jane. Left to right: Liz P., Art, and Annette. From the left: Cheryl, Sarah J., Gretchen, Liz P., Betsy, Gay, Natalie, Louise and Denise. 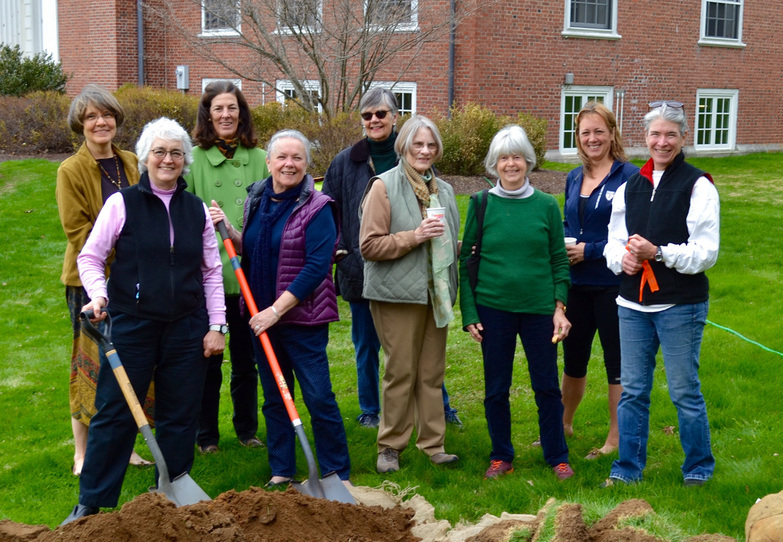 On May 1, 2015, a group of members of the Club gathered in front of Bryan Memorial Town Hall to oversee the planting of three flowering crabapple trees (Malus Robinson) donated by the Club to commemorate the Club's centennial. Liz P. (fourth from left, above) led the project on behalf of the Club. The Club has contributed to dozens of planting and beautification projects over the past century. For a partial listing of these projects, click here. 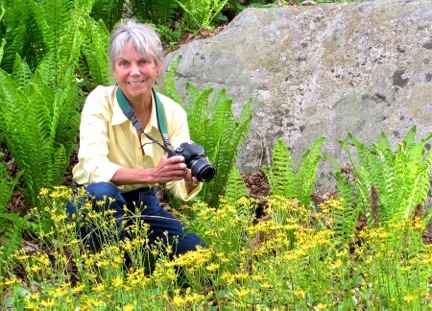 In early May, the Washington Garden Club and the Steep Rock Association of Washington, Connecticut, co-hosted a much anticipated presentation by well-known wildflower author and lecturer Carol Gracie. Over fifty participants listened, many of them taking notes, as Carol Gracie, who's latest book Spring Wildflowers of the Northeast: A Natural History, published by Princeton University Press in 2012, gave a beautifully illustrated presentation highlighting the fascinating life histories of some of her favorite wildflowers. She also explained how wildflowers are much more than a delight for the eyes, as they play an important role in nature providing food for pollinators such as bees, birds, moths and butterflies, which in turn help disperse the flower's seeds. Carol Gracie's lecture was followed by a hike through Hidden Valley, one of Steep Rock's three preserves. During the hike Carol pointed out many of the ephemerals she talked about in her lecture, such as bloodroot and trilliums. She also expressed her surprise and delight at finding so many wildflowers in the area; deer have decimated the wildflower population in New York State where she lives. 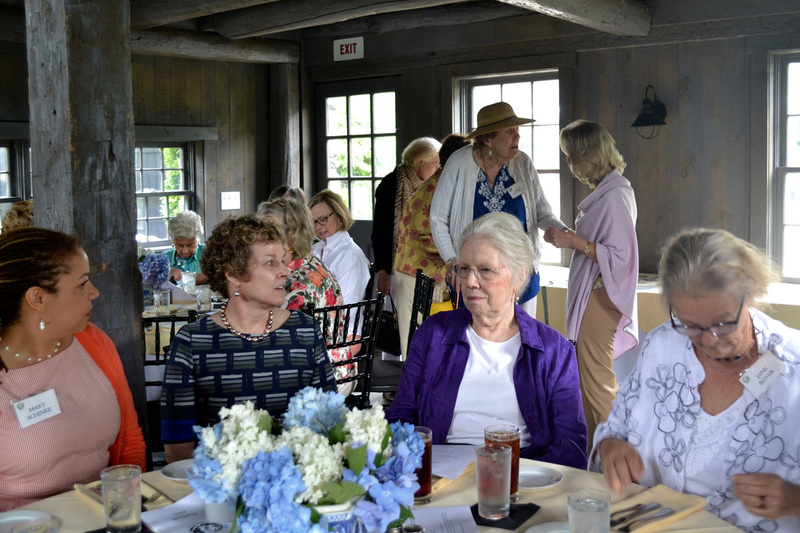 The Washington Garden Club celebrated its centennial last year and the Steep Rock Association, a Washington, Connecticut, land trust that spans nearly 3,000 acres, is celebrating its 90th anniversary this year. Both organizations share a long history of collaboration when it comes to preservation, conservation, and educating the public about the environment. 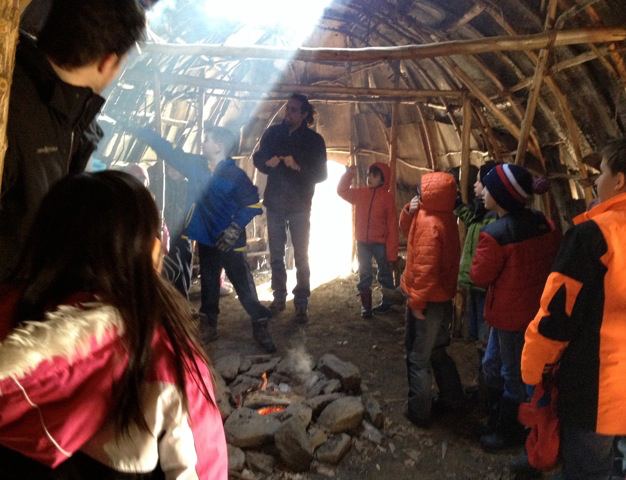 Educator Griffin Kalin explains the construction of the Sachem's Long House to the students. Children were taught how to make traditional Native American toys, and then tried their own hand at it. On Monday, March 23, 2015, third grade students from the Washington Primary School visited the Institute for American Indian Studies (IAIS) in Washington for a field trip sponsored by the Washington Garden Club. The three-hour visit, led by IAIS education director Khalil Quotap and his education staff, introduced the students to many aspects of Native American life through a combination of history, arts and crafts creativity, games that honed hunting skills, and life lessons taught through story-telling. For decades, the Washington Garden Club has worked with the Washington schools to help further young people's understanding of the natural world through a variety of different nature-oriented educational programs. The Garden Club’s annual sponsorship of a field trip to the Institute for American Studies is just one of these programs. The unseasonable cold and the mud created from the melting snow did not deter the Washington Primary School students as they walked through a replicated Algonkian village to learn about the construction of Native American homes, the crafting of dug-out canoes and the importance of native agricultural practices. In the Sachem’s Longhouse Classroom, students were introduced to both replicated and authentic Native artifacts, and were encouraged to compare and contrast the objects from different Native American cultural regions across North America. The exhibit Quinnetukut: Our Homeland, Our Story, taught students about Connecticut’s Native Americans and how they have changed and adapted their lifestyles during their 10,000 year history in the state. Another highlight of the visit was the making of cornhusk dolls, a popular Native American children’s toy. Sitting around work tables in the IAIS education room, the students eagerly fashioned this simple toy, while listening intently to the story of the cornhusk doll. According to this legend, the doll's preoccupation with her beauty so angered The Creator that her punishment was to be stricken faceless. It was only then that she learned real beauty is not to be found on the outside, but comes from within. 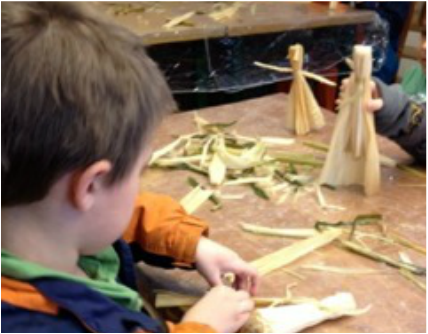 The making of the cornhusk doll also taught the students that Native Americans did not waste anything. Nothing was thrown away. Even cornhusks were put to a good and creative use. In the IAIS Research building, the class played Native American children’s games that were both fun and exciting, and also taught necessary skills that were applicable to Native American life, specifically hunting. In the game of “sneak up” a blindfolded child was placed within the center of a circle of other children, and had a piece of bone placed at their feet. One of the students from the circle had to to sneak up and take the bone, the blindfolded child later had to guess who had taken it. This game tested a child’s ability to move silently and concentrate on using their listening skills. The class also participated in the hand-eye coordination game of “hoop and pole” where a hoop is caught on a long pole to develop an accuracy that was later useful for spear throwing. Celebrating its 40th year anniversary this year, the IAIS welcomes 350 class trips a yearly, attracting school groups from all over Connecticut, Massachusetts, and New York. 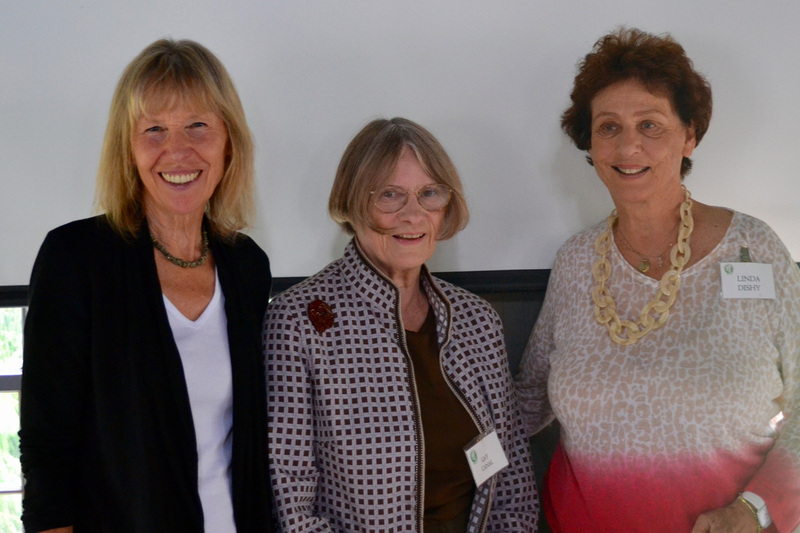 The Washington Garden Club has been a supporter of IAIS since its inception. The Club led the development of the native habitats trail on the Institute's grounds in the 1970s, visited by thousands, which educates the public about the importance of native plants. Every education program is designed to give the students an understanding of the Native American past, while at the same time emphasizing that Native Americans are still very much a part of our society here today. Through programs such as the sponsoring of these field trips to the IAIS and the support of one or more camperships for kids at the IAIS in the summer, the Washington Garden Club continues to fulfill one of its primary missions - to improve and protect the environment through education and action in the community. In 1920, John Duer Scott, a well-known photographer of the era, took a series of photographs of the gardens of members of the Washington Garden Club. These were printed and hand-colored on glass lantern slides, using a process which Scott himself had patented. These slides now reside in the Smithsonian Museum in Washington, D.C., as part of the Archives of American Gardens. For a gallery view of these photographs, click here. 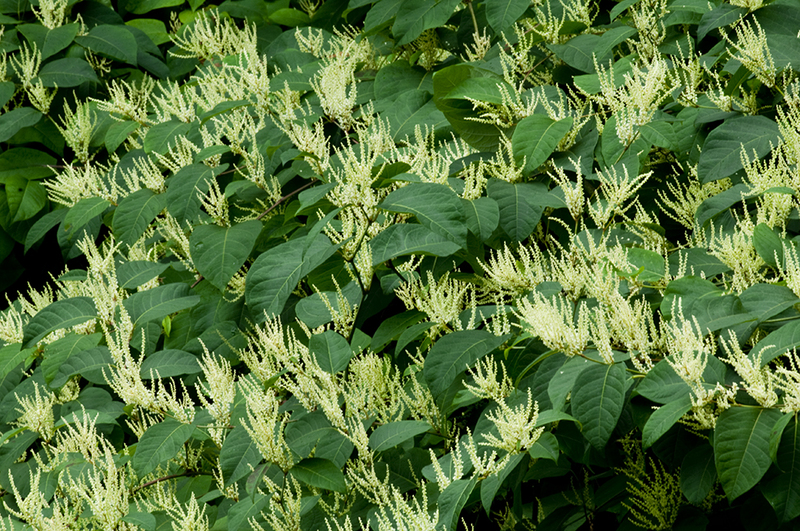 The Washington Garden Club has donated $3,000 to the Town of Washington to help finance the costs of eradication of the highly invasive Japanese Knotweed. For more information, see the Knotweed Eradication section under the Conservation tab.